These knee pads are intended for knees or shins protection during basketball games in order to prevent diffirent knees injuries, for example, bruises, bumps or abrasions, which usually are caused by various impacts, as it happens in basketball games. Ofcourse, these pads can be used in other sports and physical activities too, if there is such a need, but remember, that this product is quite thin, so it is not appropriate for sports such as volleyball or football. These knee pads have anti-slip silicone line on the edge to prevent slipping down, so even during intensive sweating these knee pads stay on their place stably. These Meco pads have padding, which is made of hundreds of hexagon type pads, therefore they perfectly conform to knees or shins shape, allowing its wearer to feel comfortable and flexible. As these basketball knee pads are seamless sleeve type pads, they are easy to put on and put off, and they are more adjustable to different knees or shins sizes as well. These knee pads are available in black or white color, therefore everyone can choose the one, which is most appropriate to its taste, needs and wants. As mentioned before, these pads are seamless sleeve type pads with paddings, which are made of hundreds of hexagon type pads for improving flexibility and superior protection. 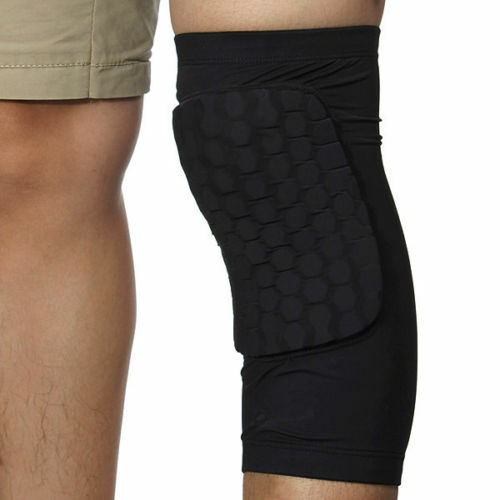 These knee pads are available in three different sizes – M, L and XL. To find out, what is your size, you have to measure your knees or shins circumference. When it is done, follow the table below. These Meco Combat Knee Pads for Basketball are intended for knees or shins protection during basketball trainings and games to prevent these body parts against different injuries, which usually are caused by impacts of different levels. These pads are made of black or white spandex fabric. These Meco basketball pads weight is about 50 grams, but their sizes are M, L or XL. They are suitable only for adults, but if knees or shins dimensions are appropriate to offered sizes, they can be worn by youngsters too. These pads have features such as anti-slip silicone line, which prevents slipping down, and paddings made of hexagon type pads. This product can not be washed in washing machine, so they can be only hand-washed. Usually these knee pads are sold as single.